As a homeowner, you want to make your home perfectly illuminated but without much of energy consumption. What else can be a smarter solution than LED lights? LED lights are famous for reduced energy consumption and are by far the most eco-friendly type of lighting. Today LED lighting with hand wave activation are also available, saving more energy for you. Here are top reasons why you should use LED (Light Emitting Diodes) lights in your home. The most prominent benefit of LED lights is their longer life. They have an exceptional operational life, sometimes even up to 100,000 hours, which is 11 years of continuous working or 22 years of 50% working. If you use a LED fixture for eight hours continuously per day, it will last for 20 years. LEDs are different than standard lights in that they don’t burn out and don’t cease working like regular lights. Plus, the diodes emit lower levels of output for a long period and become less bright. LEDs are today’s most energy efficient lighting solution with an expected energy efficiency of 80% to 90% as compared to the conventional bulbs and traditional lighting. Meaning of this is that around 80% of electrical energy is transformed into light and 20% is lost and transformed into other types of energy like heat. Traditional incandescent light bulbs are only 20% energy efficient and 80% of electricity is lost as heat. The longer operational life of LED lights serves as a multiplicator and saves even more energy, particularly large scale and in terms of urban infrastructure ventures like cities, airports and railroads. Because of the longer life of LED lights, they need less maintenance work, which brings about further saving. Most traditional fluorescent light bulbs consist of various types of substances like mercury that are dangerous to health and environment, while LED lights come without any toxic compound. They are 100% recyclable and can reduce your carbon footprints by up to one third. Also because of their longer lifespan they need to be produced in less quantity which saves materials which makes them a greener alternative to traditional lights. 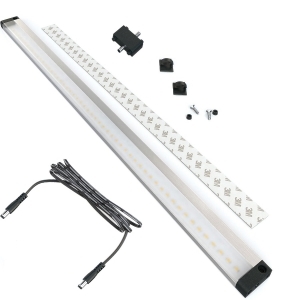 LED lights are extremely durable because they are made of sturdy and highly rugged materials, so, they can stand even the most severe conditions. They are highly resistant to vibrations, shocks and external impacts and so, they can work as great outdoor lighting for your home despite exposure to weather, rain, wind and other rough conditions, and even vandalism. LED lights produce less IR waves and almost no UV waves. So, they are suitable to materials that are sensitive to IR and UV emissions. This is highly beneficial for foods; so, with the LED under cabinet lighting, your food is safe and healthy. Because of their adaptability to any design you want, LED lights are the most suitable for your home décor, as cabinet lights, closet lighting or kitchen lighting. They are available in any shape, their brightness can be increased or dimmed and they are available in different colors too. You can achieve wonderful light effects with them with your creativity. Visit EShineStore.com for LED lights with hand wave activation which make LED lights even more convenient and comfortable. You just have to wave your hand over the sensor which brings extreme ease of use, especially in a dark place. All in all, LED lights are the best choice for you if you are a smart homeowner who finds excellent ways to get comfort without spending a lot.